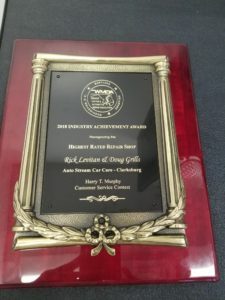 AutoStream Car Care in Clarksburg won the 2018 WMDA Industry Achievement Award for the highest rated repair shop. Our Clarksburg location won this award out of a pool of shops throughout the Washington D.C., Maryland and Delaware areas. We couldn’t acheive this award without loyal customers like you! AutoStream Car Care is honored to serve the community of Clarksburg and surrounding areas. We pride ourselves on the customer-first, service-centric repairs we provide to drivers and their vehicles of all makes and models. Our dedication to excellent customer service has been recognized by several organizations and we are grateful to have won the Highest Rated Repair Shop award 2 years in a row. Your continued trust in us means so much to us and we can’t thank you enough! We hope to keep your car on the road for many, many miles to come.